Material Description: Thermal transfer, white gloss polyimide label with a high-temp permanent acrylic adhesive that provides temperature resistance up to 500?F. Recommended for printed circuit board (PCB) labeling. Additional Information: 3 labels across. UL/cUL indoor recognition when paired with Zebra's 6200, 5095 and 5100 resin ribbon. Additional Information: 4 labels across. UL/cUL indoor recognition when paired with Zebra's 6200, 5095 and 5100 resin ribbon. Material Description: Thermal transfer gloss polyimide label with a High-temp permanent adhesive. Recommended for printed circuit board (PCB) labeling. Additional Information: 2 labels across. UL/cUL indoor recognition when paired with Zebra's 6200, 5095 and 5100 resin ribbon. 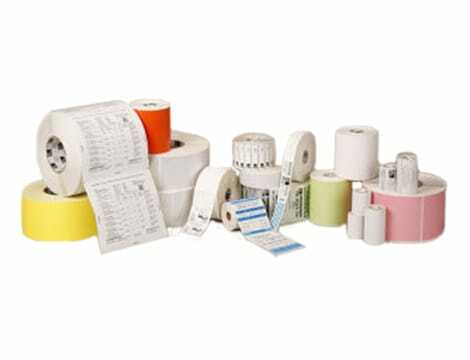 Additional Information: UL/cUL indoor recognition when paired with Zebra's 6200, 5095 and 5100 resin ribbon. Material Description: Thermal transfer white matte polypropylene label with a permanent adhesive. Material Description: Premium white gloss thermal transfer polyester label with a removable adhesive. Ideal for applications requiring up to 3 years outdoors, resistance to moderate chemicals and temperature exposure up to 300?F. Additional Information: UL/cUL indoor recognition when paired with Zebra's 5095 and 5100 resin ribbon. Material Description: Standard white gloss thermal transfer polyester label with a permanent acrylic adhesive. Provides the optimal balance between performance and price for applications requiring up to up to 3 years outdoors, resistance to moderate chemicals and temperature exposure up to 300?F. Additional Information: 2 labels across. UL indoor recognition when paired with Zebra's 6200, 5095 and 5100 resin ribbon. Additional Information: 3 labels across. UL/cUL indoor recognition when paired with Zebra's 5095 and 5100 resin ribbon. Additional Information: 5 labels across. UL indoor recognition when paired with Zebra's 6200, 5095 and 5100 resin ribbon. Additional Information: UL indoor recognition when paired with Zebra's 6200, 5095 and 5100 resin ribbon. Additional Information: 5 labels across. UL/cUL indoor recognition when paired with Zebra's 6200, 5095 and 5100 resin ribbon. Additional Information: 4 labels across. UL indoor recognition when paired with Zebra's 6200, 5095 and 5100 resin ribbon. Additional Information: 6 labels across. UL/cUL indoor recognition when paired with Zebra's 6200, 5095 and 5100 resin ribbon.